The police union was picketing mayor Tuesday morning at Gracie Mansion and at the Park Slope Y in Brooklyn. 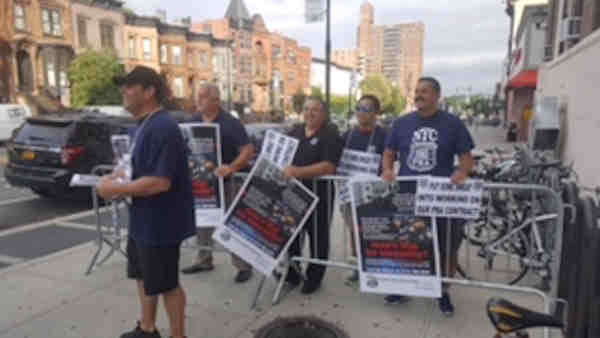 PARK SLOPE, Brooklyn (WABC) -- The police union was picketing mayor Tuesday morning at Gracie Mansion and at the Park Slope Y in Brooklyn. According to the Patrolmen's Benevolent Association, members are protesting the mayor and his administration for refusing to work with police officers to reach a "market rate of pay." Union members want higher salaries and more benefits. The PBA lost an arbitration battle for higher raises in November after turning down a benefits package. The protest will be at the gym because it has been a source of controversy for Mayor Bill de Blasio. He has been criticized for his taking time during the day to go back to his old Brooklyn neighborhood to work out, and partly because he frequently is there mid-morning, when some say he should be at City Hall. "We have to go where he is," said PBA President Pat Lynch. A statement from the mayor's office said, "Our door has always been - and continues to be - open to the PBA to negotiate a long-term contract, as we've done with nearly the entire City workforce to date." "Our door has always been - and continues to be - open to the PBA to negotiate a long-term contract, as we've done with nearly the entire City workforce to date." Protests are expected to last for several weeks. The PBA of New York represents nearly 50,000 active and retired New York City police officers.